Here is my Travel Tip and advice on fans in Hotel Rooms. A ceiling fan is the worst, yes you will stay cool, however, normally it blows directly down into your eyes and causes irritation. 1. 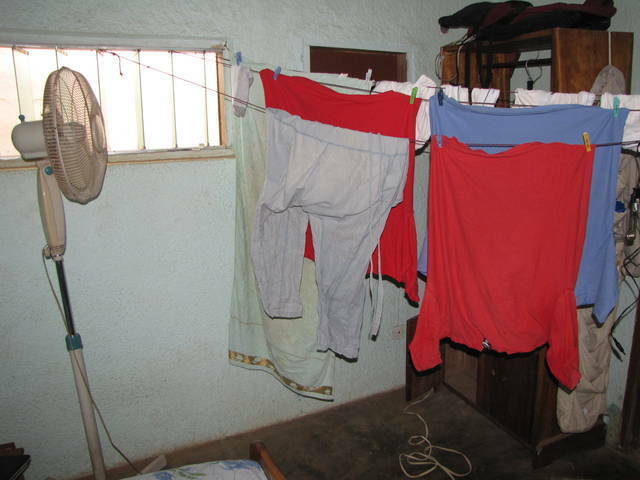 Dry your clothes by point at the end of the clothesline. 2. Point it out the window to circulate fresh air and dry the humidity from room. Often a room feel hot only because of the humidity. At night, I put on low, and wake to a nice fresh room, and when you cook in the room this helps. 3. Point the fan at your lower body, do not point the fan at your eyes, this will cause problems. I do not allow the fan to swing, this causes to much noise, however it may circulate the air. If the fan is noise, stop the swing, and take the front cover off the fan, this 80 percent of fan noise. If there is a grinding noise, remove the cover all the electric motor, this will normal stop a noisy swing unit.